Sweet, and delicate, balanced, sweetened by hints of cacao, fruit and almonds. 100% Arabica Intensity : 7/10 Content: 10 capsules of 8g of roasted and ground coffee. The perfect blend of South American Arabica and Indian Robusta for a decaffeinated coffee with an intense and fruity notes. 50% Arabica 50% Robusta Intensity 8/10 Content: 10 capsules of 8g of roasted and ground coffee. The fine qualities of Central and South American Arabica for a a sweet espresso with fruity notes. 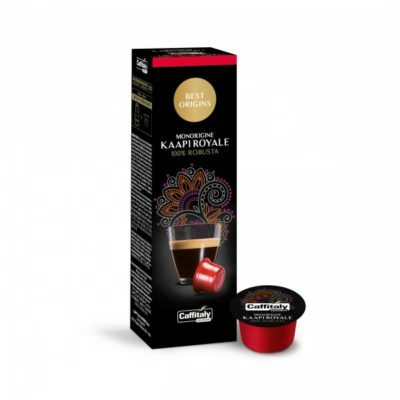 100% Arabica Intensity 8/10 Content: 10 capsules of 8g of roasted and ground coffee. 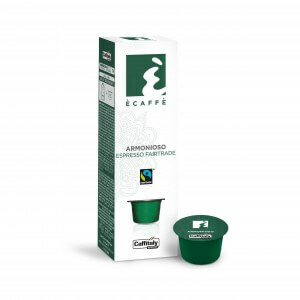 An espresso with a strong taste and an excellent full-bodied with notes of cocoa and dark chocolate 100% Robusta Intensity 10/10 Content: 10 capsules of 8g of roasted and ground coffee.